This 3x sniper scope was made by Voigtländer in Braunschweig. A lot of these were used during WWI. This one is bearing the rifle serial number 1139 cc but its mounts bears a different number. Below you can see a b&w picture showing a German sniper using this scope in the trenches during winter 1916. 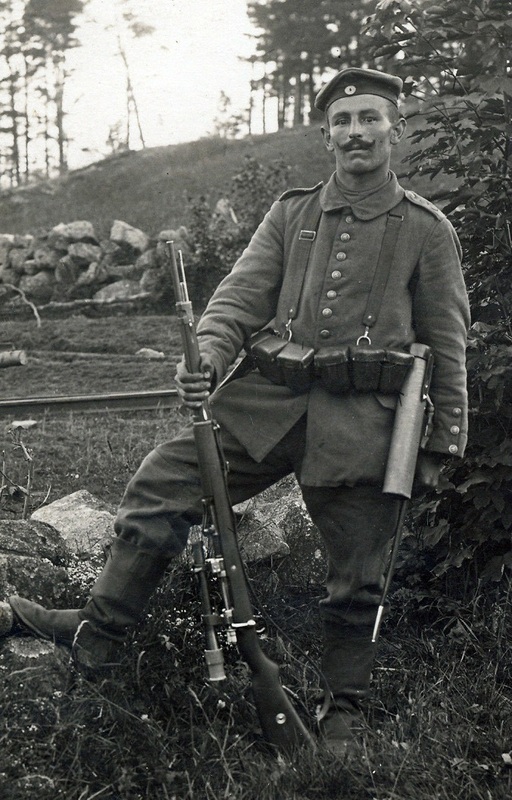 Here is a complete set used by a German sniper during WWI. The scope was made by Oigee in Berlin, model Luxor 3x. The scope, mounts and carrying case bear the G98 serial number 7368 bb. The case also comes with its little cleaning brush and mount adjustement key. 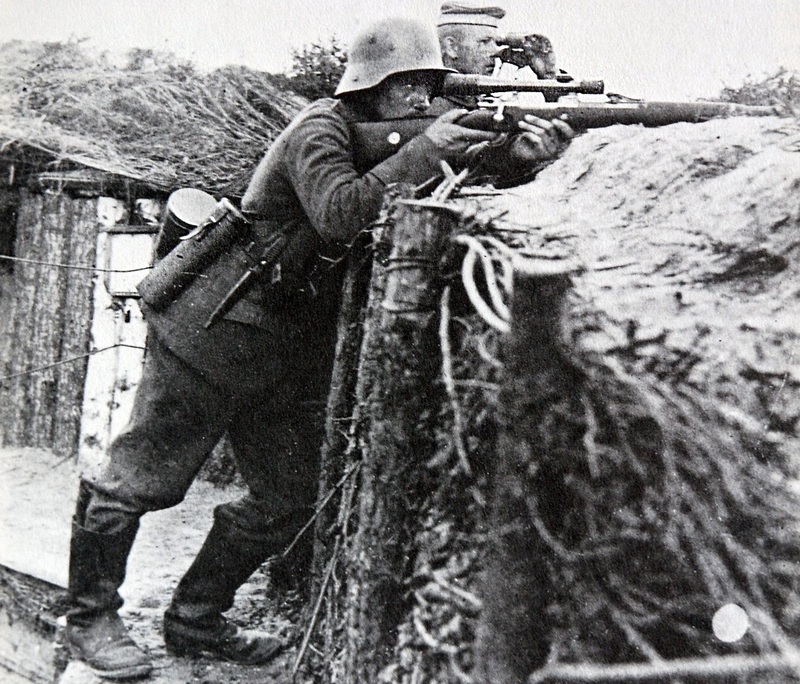 The well-known picture below shows a German sniper aiming through a similar scope from its trench during WWI. Note the carrying case attached to its belt. A WWI sniper scope made by Emil Busch A-G in Rathenow. This model Visar 2,75x comes with its matching carrying case and the remains of a leather eye cap. Rifle numbed engraved on the scope and the case is n° 5756 d.
A complete WW1 set composed of a Oigee Berlin Luxor 3x scope with its matching carrying case (rifle. N° 2495 z) and accessories. The small key was used to move the rear mount leg when mounted on the rifle. 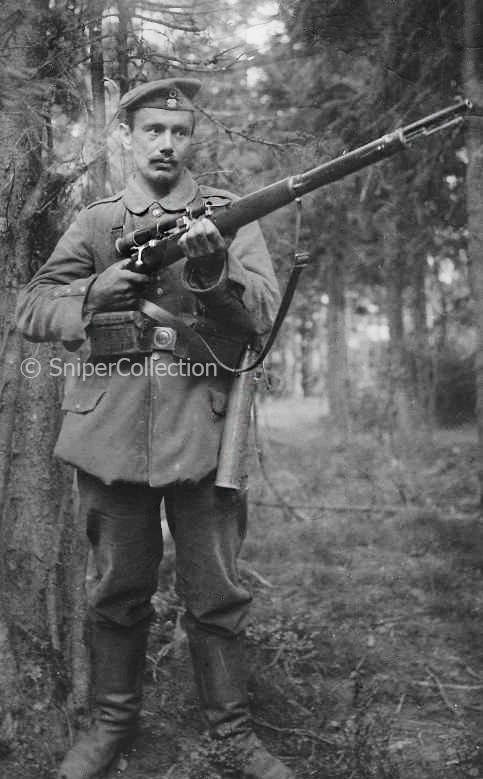 Emil Busch A-G Rathenow Visar 2,75x was one of the most used sniper scopes during WWI. 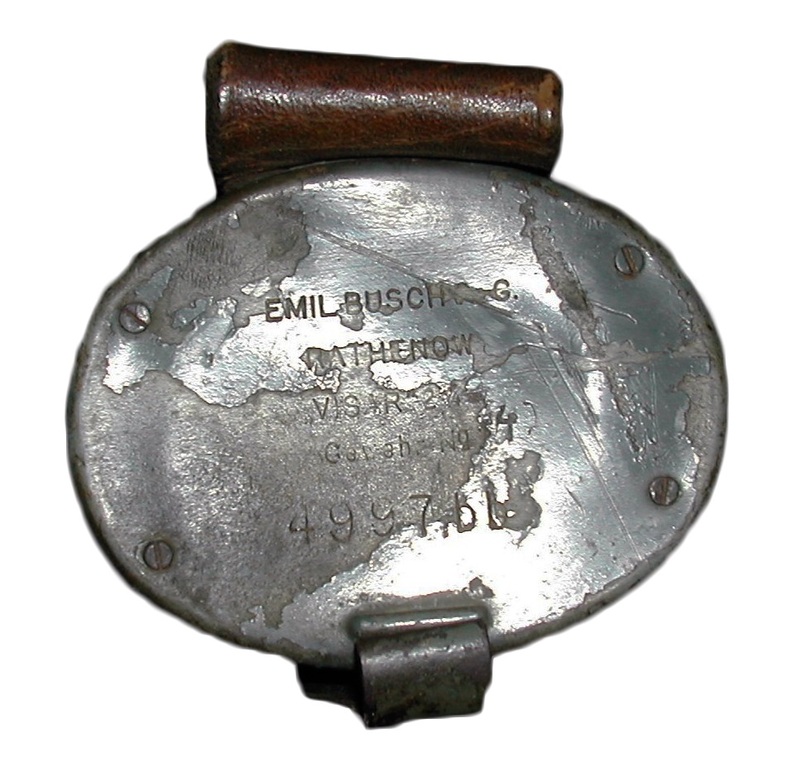 This one was mounted on the rifle n° 5756 d.
Metal carrying can issued by Emil Busch A-G in Rathenow for the 2.75 scope during WWI. C.P. Goerz Berlin 4x is an interesting WWI scope because it was mounted on a mount which could be seen as the ancester of the WWII turret mount. This was, with the similar Goerz 3x mount, the only mounts from 14-18 that could be changed from a G98 to another one without modification (having the right bases on it, of course). Another rareWW1 sniper scope made by R. Fuess Berlin-Steglitz. Green paint was pretty uncommon 14-18 sniper scopes. Only a few manufacturers used this finish on their scopes, mostly late war. World War I sniper scope made by Hensoldt in Wetzlar. This model, Ziel Dialyt 2,75x, probably was the smaller sniper scope used during the WWI. This one was mounted on the rifle (Gewehr) N° 7835. C.P. 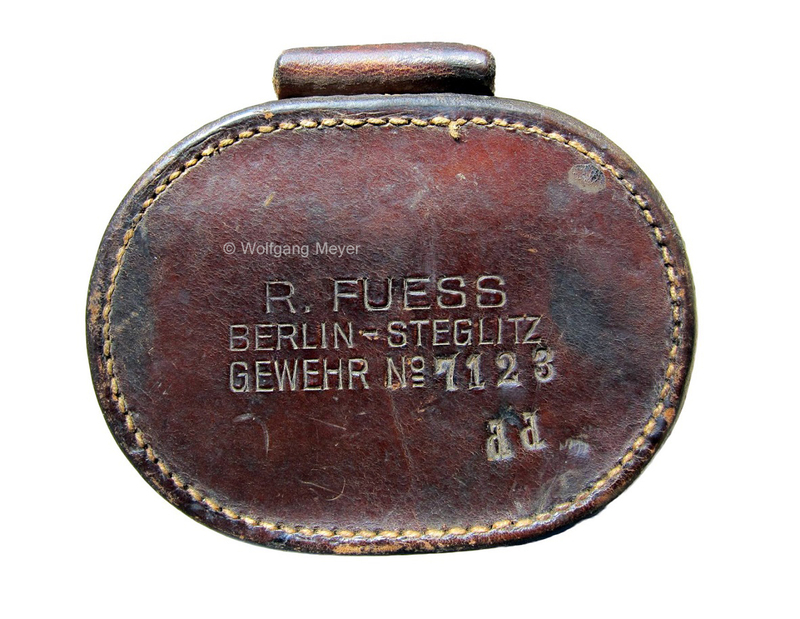 Goerz Berlin 4x Carrying case made during World War I era. The case was originally painted green. Here is one of the “classic” Prussian sniper scopes used during World War I. This 3x scope was made by R.Fuess in Berlin. Scopes made by R.Fuess were sometimes painted green. 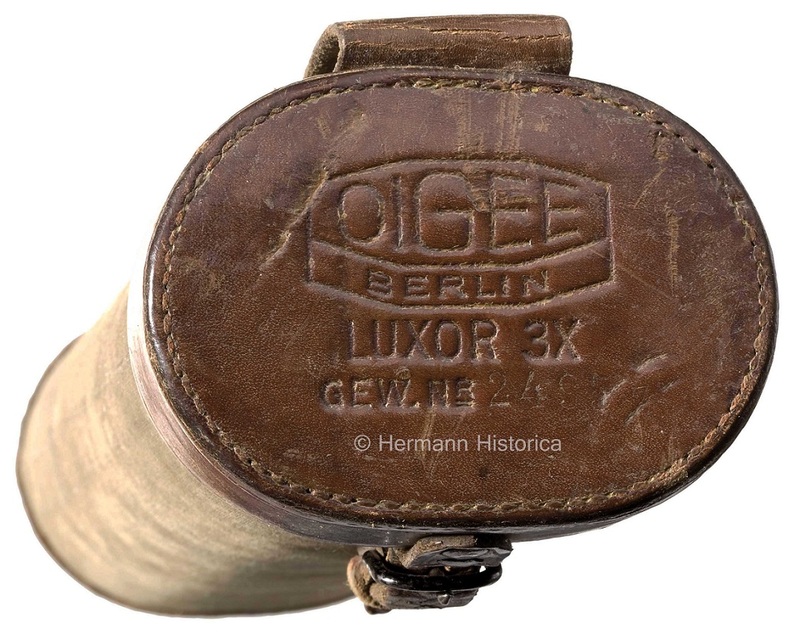 Luxor 3x sniper scope made by Oigee manufactuer in Berlin. This model was one of the most used during WWI. Its deported mount is also typical and wears the same rifle number “n° 712 i” than the scope main tube. Meter dial is Prussian 1-10 style. Skoparette 4x scope made by Voigtländer manufacturer in Braunschweig. It had Bavarian style meter dial 2-4-6 (200m-400m-600m). You can see by the deer logo that this model was a civilian hunting scope at the first place, before to be used by Bavarian snipers during World War I.
C.P. Goerz Berlin 3x scope wearing the rifle number (gewehr. Nr.) 6876. Meter dial is Prussian style 1-10. This mount was one of the first interchangeable models made for sniper use, allowing to mount the scope on any other rifle fitted with the right bases without needing of gunsmith modifications.